Sprout: Purplish red, barrel-shaped, medium hairiness. pigmented, with developed wings , corrugated majority. large, round oval (I = 1, 70); Semi-Knocked limb. Sensitivity diseases: Leaf blight: fairly susceptible. Virus A: NTR Virus Y: susceptible. Leaf roll: susceptible. 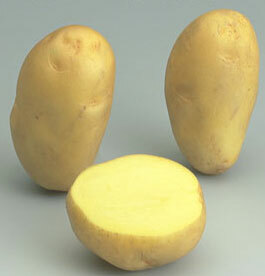 hardy variety, very productive, giving large tubers, regular, with shallow eyes, good conservation, but low in dry matter.